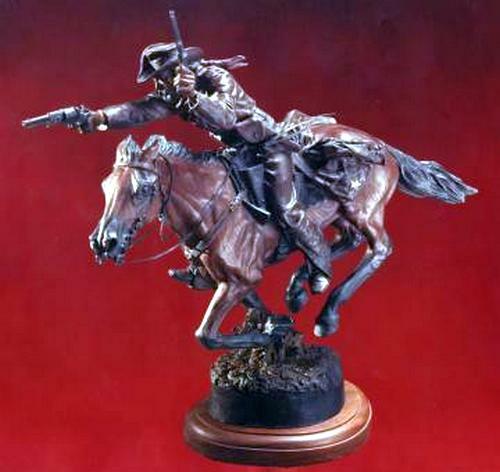 Depicts a Texas Confederate armed with a huge .44 ca. 3rd Model Colt Dragoon revolver left over from the Mexican War and a smaller .36 cal. Dance & Bros. "Navy" pistol manufactured in Columbia, Texas during the Civil War. Like many of his kind who were used to close-in, hard and fast pistol action, he sports a second "brace" of Colt's pistols on his hips and his "last resort" tucked in the top of his border-type leggings. He rides a "Texas Tree" or "Hope" saddle; lightweight with its characteristic short horn over which are a set of pommel holsters. A wooden canteen, linen duster, Mexican War haversack, ever-present lariat, breast-collar with Texas star shield (original in my collection was dug up in a Texas Cavalry camp) and bridle with early Dragoon-type bit complete the trappings on his fast Texas mustang.